Eating for You is ideal if you’re interested in food and wellbeing, as well as making changes to your way of eating for health. It builds clarity and confidence in making personalised eating and lifestyle choices. Sallyanne provides step by step guidance to help you select what is best for you—based on knowing yourself, knowing your food, and knowing how to introduce and live with change. Available in hard copy, or as an E book. Eating for You includes a bonus workbook with your purchase. Read the reviews below and the review by well-known nutritionist and author, Catherine Saxelby. There is no one perfect diet for everyone. We are all different — our experiences of eating differ, our lifestyles vary and we have individual needs. So how do you work out what is right for you? Eating for You introduces 10 Principles to guide you in personalising your way of eating and living based on knowing yourself, knowing your food, and knowing how to introduce and live with change. These principles combine Western science and the Eastern wisdom of Ayurveda and Traditional Chinese Medicine. They outline a unique approach that increases your clarity and confidence in introducing meaningful change through mindfulness, reflection, meditation, and reference to the changing seasons (the harvest wreath). Mindfulness connects you with your motivations for eating and your personal health and lifestyle needs. It enables you to enjoy more energy, improved health and a greater sense of wellbeing. Uncover how your eating habits affect your health. Identify ways to improve your experience of health and wellbeing. Know how to select and prepare nutritious food. Create a balanced lifestyle and supportive relationships. Gain confidence in choosing what’s best for you with the support of your healthcare practitioners. Resolve and remove obstacles that stop you from improving your health. Let go of your struggle with change. Eating for You is for everyone interested in food and wellbeing as well as those wishing to make changes to their way of eating for health, such as having diabetes or being overweight. Sallyanne Pisk is a nutritionist and Accredited Practising Dietitian with over 20 years experience. Her interest in Eastern approaches was initiated through her involvement with Traditional Chinese Medicine 15 years ago. Sallyanne promotes a simple, whole food and seasonal approach to eating. She emphasises the importance of knowing your mind and body to experience better health and wellbeing. Eating for You is wonderfully presented and engaging. It providers a highly professional and non-emotive view of Western and Eastern approaches to diet and lifestyle. It is extremely well researched and offers appealing case studies and personal stories. The points of difference between Eating for You and other books are quite significant. It offers the reader ample resources, direction and support to make lifestyle changes that will benefit their personal health needs. I will definitely recommend the book to patients, friends and family. Hi Sallyanne, I have been reading your Fourth Course in Eating for You, on change. I have found it to be fantastic. Being a creature of habit, but a big believer in change I found it very beneficial, clear and concise. A resource I am sure I will look back on many times over the years. Thank you. Eating for You is a wonderful book. I thoroughly enjoyed every page of it. I may not overeat, but I don’t always make healthy choices when it comes to food. What I found is that I could relate the mindfulness practices in this book to other aspects of my life. The reflection at the end of each chapter was great, and an excellent way to back up what I had just read and gently implement it into my life. Eating for You is a very enjoyable read, and very well written. Thank you Sallyanne. I feel that I have learnt the most important less in my life – how to attain wellness. I can conserve the energy my body needs, rather than using that energy to digest unsuitable food, at irregular times when I am in not the right frame of mind to eat. The book incorporates general principles of wellbeing and living. No matter what you eat, you need to eat at regular meal times, in a quiet environment, and with a quiet mind – to allow the digestive process to cope with the intake of food in harmony with the whole body. I have tried diets and other eating programs, all of which impose limitations on individual ongoing learning – but none that have focussed on mindful eating. I realise now that it is up to me to understand my body and its needs. I highly recommend the Eating for You book to support and guide your learning. This learning is an ongoing process, which is exciting when you know the steps to take. 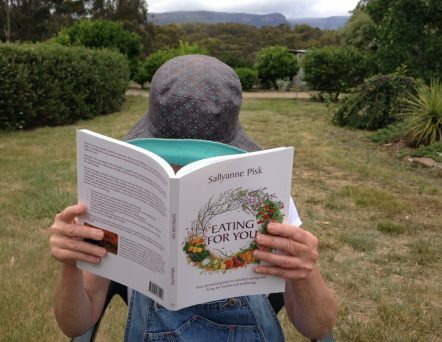 Sallyanne’s wonderful book, Eating for You, is an amazing supportive tool. I love the ‘self-talk’ section. Eating for you explains how food, lifestyle changes and health are so very integrated together, like a ‘well oiled cog in a wheel’. This book is highly recommended by me if you are planning to change your direction and vision of improved health and wellbeing to feel and look good. Eating for You gathers together eating and lifestyle information, and offers personalised guidance. It is easy to read, understand and apply. Eating for You provides amazing support for people with weight issues and emotional eating habits. I definitely recommend this book. It offers a new horizon in the field of health and nutrition. Thank you so much for your wonderful work. I keep the book in my office and refer to it often. Eating for You very well written and a gem of a book. I felt as though the author was talking specifically to me, and I am now making informed choices based on ethical and environmental issues. Eating for You promotes lifestyle balance—the chapter on meditation impressed me with its simple straightforward guidance. I now think before I eat and I actually taste each mouthful. Eating for You is very easy to read and offers a wide range of information. It is well set out, with each chapter covering a stand alone topic. Eating for You provides for a whole mind, body and spirit experience. I particularly love the East and West integration. This is a book that has been written for modern times in mind, and it actively encourages contact with the author through the Eating for You website and Facebook and Instagram pages. Hi Sallyanne Pisk, Loved your book. As Lee and I made a conscious decision about empowering our bodies to heal and improve our health and wellbeing, your book, Eating for You, came into our lives at the right time. We found the information easy to read and implement into our healthy living routine. We learned about mindful eating, and as a consequence, our daily living became an extension of our minds and hearts. Your book now takes centre stage in our kitchen, as it has become a great reference manual for our family. I do thoroughly recommend your book to anyone who is looking to improve their health and wellbeing. Thank you Sallyanne for your lovely book. I am learning so much to further complement my quest for a more healthier mindset, and your book has taken centre stage in the journey right now. There are many impressive aspects to the book that Sallyanne has written. The first that struck me was the logical progress through the chapters. She starts with examining the importance of understanding ‘where you are at now’ with your eating habits. By this she encourages the reader to explore their core beliefs and cultural approaches to eating patterns and behaviours. As a psychotherapist of many years standing I know that until we can see what our behaviour patterns and beliefs are right now in life, it is very difficult to set a goal to change them. Sallyanne sets the first three chapters as groundwork for the rest of the book. From there Sallyanne guides the reader through the journey of learning how and why we can eat better and more healthily, but also then broadens the scope into lifestyle choices and the impact they can have on our health. Examples such as developing meditation, breathing or exercise practices are included and really bring this book into its own with the depth and understanding Sallyanne has of creating a balanced lifestyle. Finally, something that is rarely considered in self-help books is a comprehensive section on what change encompasses, how to embrace the experience of change, its affect on yourself and others and the importance of maintaining a mindful process around everyday choices. The importance of becoming more fully aware from moment to moment about our choices in life is dear to my heart professionally and personally. It can be a challenge when it comes to food as there are so many motivations for eating, and particularly eating poorly when under stress. The more we can practise good choices when we are in a balanced state of mind, the easier it will become when we are tempted to fall back into bad habits. AND this is where Sallyanne’s book really comes into its own. She carefully and thoughtfully balances the information with exercises and reflections that support the development of awareness around all our habits and the change process itself. She clearly has researched extensively, and in depth the work she has presented here, and yet manages to portray it in an easy to understand manner, without diluting the strength of the message or the science behind it. I’m thrilled to know that Sallyanne will be starting her online courses soon. This book stands alone for anyone who wants to use it for themselves, and the online programme to enhance its value and solidify new habits will be the icing on the cake! This book could have easily been called ‘Mindful Eating’ as it helps us to become more aware of how food fulfills our various physical, social and emotional needs and that the most important step in mindful eating is to examine our relationship with how, what and why we eat. The author takes you step by step through a series of 10 principles that you can use to review your own knowledge, habits and impacts of the food you eat. For example, the first principle, Eating Habits, helps you examine your own habits to determine more clearly your own needs for food and if your habits are meeting these needs or not. Needs are differentiated from ‘wants’ or habits such as craving sugar-filled foods that give us a temporary lift. In this example, our need would be for energy and therefore there may be other ways for us to meet that need, rather than continuing to grab a sweet treat as a snack. Awareness is the key theme of the book as it isn’t a ‘fad diet’ type of book, but rather it provides an empowering approach to giving us the keys to understanding more about food and why it so profoundly influences our well-being. ‘Eating for You’ provides a modern and balanced approach to creating a healthy relationship to food. I found that the general information in the book was also quite useful, as it helped me to understand more about the qualities of different foods so that I could be more selective in my choices. While food is the main theme, it is the context of our relationship with food that gives the book a different angle. This context requires us to re-examine all of the reasons ‘why’ and ‘how’ we eat. I especially appreciated the chapter on ‘Food as Medicine’ as it introduced Ayurvedic and Chinese Medicine approaches to understanding the role of food in maintaining our mental, emotional and physical health. Even if you don’t have a ‘concern’ about your diet, I’d suggest you read this book, as it will open your eyes to aspects of food and your relationship with it. In particular, it will give you a positive re-evaluation of how ‘eating for you’ can further enhance your own well-being, as well as create a deeper connection to the wonderful array of foods that are a foundation for a healthy life.